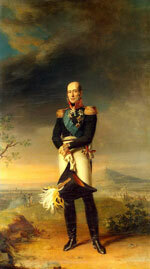 In 2014, as part of the Year of Russian culture in the United Kingdom of Great Britain and Northern Ireland, the Year of British culture in the Russian Federation and celebration of the end of war with the army of Napoleon, the honorary monument to field marshal Barclay de Tolly, outstanding Russian military leader, hero of the wars with Napoleon, one of the most illustrious representatives of the earliest Scottish clan of Barclay, will be installed in the city of Aberdeen, Scotland in the historic part of the old city, on the territory of one of the oldest British universities — University of Aberdeen. The author of the honorary monument is Salavat Aleksandrovich Sherbakov, People’s Artist of Russia, academician of the Russian Academy of Arts, head of department of sculpture of the Ilya Glazunov academy of painting, statuary art and architecture. The honorary monument will be made with the funds of unsolicited contributions and granted by the “Shukhov Tower” Foundation to the people of Scotland. On the questions of sponsor participation all the interested persons may address the “Shukhov Tower” Foundation.